Cadillac Black for those who appreciate luxury, elegance and sophistication. Cadillac Black 100ml. Eau De Toilette is a fresh masculine scent with a strong emphasis bergamot. Get your elegance and unique style tailored to confident men. To make an impression on their surroundings, dial clearly perfume Black Limited Edition! Remarkable connection calming chamomile and bergamot significant help ensure all the attention. 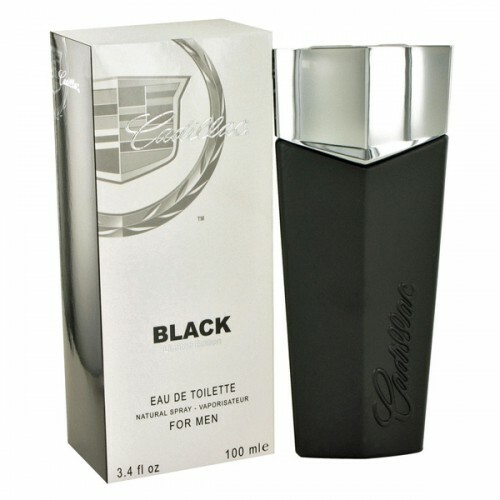 The sleek black bottle is also extremely practical and help you in applying your favorite fragrance. Try and you will never be boring and dull with another stunning bomb from Cadillac. Fresh combination of wild mint and bergamot, which permeates integral smell, you feel the outset. Later open overtones of orange blossom and chamomile, which soothes your body and mind. Chord warm cedar wood and noble incense will pamper you in the end and give you a special look slightly mysterious seducer for an incredibly long time. Outstanding company with luxury cars, Cadillac, launched on the market and line of fragrances, which have similar characteristics as the main production part of the brand. They evoke in you success, elegance and unparalleled charm. Men and women around the world swear by the perfume Cadillac. They are always good and extremely Nice at, whether it is a sensual spicy tones and subtle floral chords. Perfume Cadillac Black Limited Edition is based on the popular series Cadillac for men and bears in spirit-branded cars. Get your elegance and unique style and always attract attention and to make a great impression!